As both a cyclist and a driver, like many adults in the Netherlands, I have to say that I much prefer driving without the risk of hitting a cyclist. Driving in the Netherlands is often a lot quiter because lots of ccyclists mean a lot less car movements. My son woke up too late for a school exam last week, so for just once I threw his bike in the car boot and drove him there. I hated adding pollution, but was glad that at least he could cycle home by himself. But it made me think what a terrible mess it would have been if ALL parents of the 6000 students of just the four schools in this area would drive their kids. We would have had to build three times as much through roads. Now, I think just the kids in wheelchairs or with a leg or arm in plaster get driven, perhaps 1 or 2 in 1000 kids. You said it before David, and why don't people get this: cycle paths are cheaper to build than not building them. .... and to pick up on my previous comment: and what a huge amount of time, fuel and money is wasted when parents have to act as chauffeurs to their children! I know of a boy with Down's syndrom who rides his own magnificent recumbent trike to school, some 5kms off. He really looks happy cycling. Of course it is safe for him to do so: the paths are separated, the route is unobstructed, and easy to follow. The mess you describe is the UK. Have you thought about submitting this as a paper to the Transportation Research Board for a paper, poster or hosted presentation (for TRB 2013)? There is only one type of cyclist who has a problem with such infrastructure: the long distance cyclist. 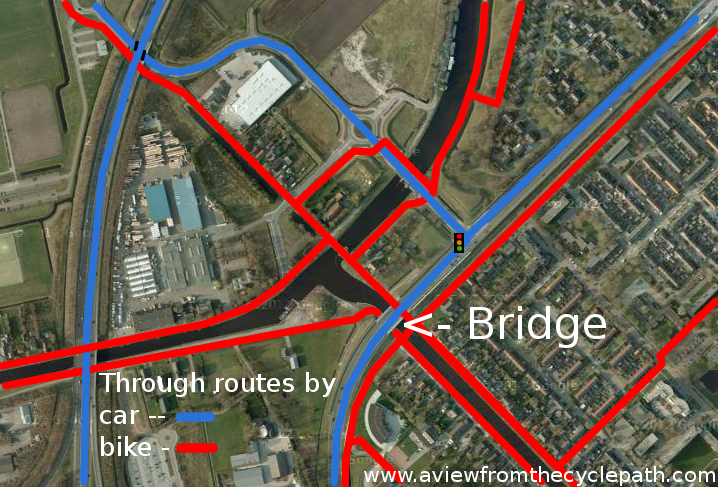 When you are a local resident, you know all the cycle routes in your own town, but for a tourist travelling from one town to another it can be troublesome to find a good route when this unravelling of modes takes place. That's why it's so great to have the Routeplanner from the Fietsersbond, where you can plan a route for longer distances and put it on your GPS. What happens if you don't want to use those narrow bike paths? What if you want the extra width that the road offers? Are all roads in the Netherlands (apart from high speed motorways) open to cyclists? Ian: You pose a loaded question and clearly have an agenda. The answer is yes. You can use almost all roads which are not snelwegen or autowegen. However, there is another related question: Why would you want to ? Cycle-path widths are greater than you think. In our area, a minimum of 2.5 m wide for single direction use and 3.5 m wide for bidirectional use, and bicycle roads are 5.5 m wide. You've clearly not understood how things are in the Netherlands. Drivers have a much smaller subset of the whole to use than is open to cyclists, and cyclists get very much the best end of it. Cycle-paths and roads designed to exclude cars allow cyclists to avoid nearly all traffic lights, and make more direct journeys than is possible by using the roads which car drivers have to use. The result is that an average person (i.e. anyone extracted from the entire population) makes faster journeys by bike than they do by car, and this convenience is one of the reasons why the Dutch cycle so much as they do. Remember that in the Netherlands it is not just the fit subset who would cycle in other countries who use bicycles. Rather, everyone cycles, including the very young, people with disabilities, and there has been a huge rise in recent years amongst older people. The sporty demographic exists here too, and people who want to go fast go very fast indeed. What's more, the new network of intercity superhighways is built specifically for high speed commuters with a view to getting people with longer commutes out of cars. It all works very well. How on earth do you think the Dutch would have convinced everyone to cycle so much as they do here if it was inconvenient ? David: you forgot to mention that most cycle pats in the Netherlands are mandatory for cyclists under 75 cms wide (so not always for your Mango, I guess)but I have to say, Ian, that for Dutch people this question is absurd in 97% of cases or more. Why would you ever want to? It would be unsafe, noisy, strssful and often slower. Alright, in a mionority of cases older cyclepaths can be a bit rougher (most are being replaced) but not anything like cyclepaths in other countries. And still they would be much preferable to the road. Thing is, you must not think that Dutch cyclepaths are anything like the ones you know of in other countries. Those tend to stop before the junctions, instead of helping you cross them, are too narrow, bumpy, unconnected. Here, not so. They're used by a lot of racers as well, that should say something, but David already said so. And if you rally want to speed up, take the cyclepaths in the countryside. You can tour the entire country on them! Yeah, it's a loaded question, because advocates of Dutch bike culture refuse to admit that there's a problem here. And I do have an agenda here - to point out that someone is hiding the truth about Dutch bike facilities. Why is it that no Dutch cycling advocate ever seems to find it convenient to mention that marked bike paths are mandatory use in the Netherlands? You say they aren't (presumably because you don't know the law, because you're happy to use the bike path), but they are. According to Wikipedia: "Many roads have one or two separate cycleways along them, or cycle lanes marked on the road. Cycling on the main carriageway is not permitted on roads where adjacent segregated cycle facilities exist so, where they exist, the use of such facilities is legally compulsory." According to Angloinfo.com ( http://amsterdam.angloinfo.com/information/37/cycling.asp ): "cyclists must use the cycling path if there is one. Cycling paths that are marked with rectangular blue signs, marked fietspad are not compulsory. Where there is no cycling path, cyclists may cycle on the road along with cars." "I have to say, Ian, that for Dutch people this question is absurd in 97% of cases or more. Why would you ever want to? It would be unsafe, noisy, strssful and often slower. " I've always enjoyed cycling on the road. For me, bike paths are more stressful than the road - they are slow, too narrow, the surface is often of poorer quality. The idea that the road is more dangerous than bike facilities is nonsense. Many studies have shown the opposite to be true, as bike facilities tend to make cyclists less visible. as for speed, it's never been much of an issue for me, but my experience cycling in Holland did not convince me that bike paths were faster than the road. Ian, It is quite clear that you have never lived here and simply don't know what you're talking about. For a start, not all bike paths are mandatory. It depends on the signage (round vs. rectangular signs). While people like yourself, who speak only English, use only English language references and are viewing from a few thousand miles away, might imagine that you see a problem with cycling in the Netherlands, the people who actually live here are getting on with a life which includes use of bicycles every day to an extent that you would find astonishing. Perfectly average people here don't use bikes despite inconvenience and danger. Why on earth would they ? Rather, they do it because it's convenient and extremely safe. How safe ? Dutch cyclists are the safest in the world. The rate of death for cycling in this country is five times lower per km travelled than in your country. The rate of injury is 30 time lower. No-one is complaining about being "forced" to use cycle-paths because there is no inconvenience caused by this. As cyclists we get the better end of the stick. Cyclists have access to direct routes without interruption which are not open to drivers. What's more, a vast proportion of the total road network has been made virtually unusable by car freeing up even more infrastructure for bikes which is not used by cars. The surface is "often of poorer quality" ? Utter tripe. It's sometimes of lower quality, but also sometimes of far higher quality. There are no potholes in the city which I live. Not one, either on the roads or on the cycle-paths. More than half the surfaces have been replaced in the five years that we've lived here, which is in line with the local policy of replacing everything every seven years. Are the roads that you cycle on all less than ten years old ? Do you have potholes in Maryland ? Here's a few photos and a bit of video showing how a cycle-path near our home was resurfaced, and you may also find it interesting to find out what happens to preserve the routes of cyclists when cycle-paths are being resurfaced. What's more, it's actually quite common for cycle-paths to have better surfaces than roads. For instance, here is one of many examples which was on my commuting route. Oh, and what an interesting route that was. 30 km each way, of which 28 km was on cycle-path and 2 km on minor roads. I encountered just one traffic light in that distance which is set up to default to green for bikes. I had priority over almost all junctions and side roads, the surface was in the most part better than that of the road and the distance was shorter than any driveable option. Expecting to be able to ride at top speed on the cycle paths of the Netherlands is like expecting to do uneven parallel bars routines on the playground. The facilities were simply built for the use of the majority. Unfortunately, in the US the majority is trapped in their cars. I think the conflict between Ian and David stems from 2 different views of what a "cyclist" is. To David, and in the Netherlands, it's a person, any person, every person, who rides their bike anywhere, to work, to play, maybe for sport now and again, but mostly just as part of their daily life. To Ian, and in the US, a cyclist is a minute subset of the general population. They're an athlete, a risk-taker, and cycling generally is NOT a part of their everyday routine. They get dressed up in special clothes and plan special routes. They join clubs and have to seek out like-minded individuals to ride with. I have never lived in the Netherlands, but I did spend a month travelling through the Netherlands. You don't need to live in a place to get a sense of its bicycle infrastructure - all you need to do is use it - and I have. As for the idea that I think all bicycle facilities are mandatory, this is a straw man. I specifically said that some bicycle facilities are optional. My point is that some are not, and that this makes a mockery of the assertion that the Netherlands is a bicycle utopia. You have not adequately addressed this criticism - nor do I expect you to at this point, as you seem to be more interested in character assassination. Alexa, although your characterization of American cycling is probably accurate to a great degree, I am not an athlete or a risk-taker. Nor am I American (I'm English, although I do now live in the US). I never dress up in special clothes to cycle and I cycle almost every day, as I have done for over 30 years. Alexa, what you say has an element of truth, but it's not the whole story. While they are outnumbered by many people who are not interested in sporty riding, the Netherlands has a higher proportion of people who do the athletic type of cycling than other countries. Whole peletons of racers ride on the cycle-paths here. These are not just amateurs but also pros. Members of the Rabobank and other teams live locally and they also ride along our cycle-paths in preference to the road. I've taken lots of photos. The objections that Ian raises come from nothing more than a position of ignorance. Ian, according to your online information about yourself, you cycled through Western Europe "between 1984 and 1986". Has it occurred to you that due to the level of maintenance and upgrading that is normal in this country, the infrastructure you saw then, which fills your fading memory and which you think gives you an understanding will in many cases have been replaced three times since your visit ? You might imagine that one month is enough for you to understand, but I can assure you it is not. We spent a decade making trips to this country before emigrated and we've now lived here for five years. I'm still learning. While you say that you "never dress up in special clothes to cycle", the picture of you at the top of your blog shows you wearing a helmet with a mirror attached. Unless your neighbours wear the same to drive their cars or watch TV ? This exposes the lie of your claim to be "not an athlete" etc. Simply by riding a bike, you are by definition part of the very small subset of US residents who cycle. What's more, you're enthusiastic enough about it to write a blog about your adventures. It's a nonsense to claim otherwise. Now, can we please go back to normal facts and figures (I've provided references, photos etc. to support everything I've said) without your disinformation based on a jaundiced view of your faded memories of 30 year old infrastructure ? When I read Ian's blog it seems to me that what irks him most about Dutch bike paths is the perceived lack of freedom to ride anywhere. This is typical motorist's thinking: the road should be free for use by anyone. We simply don't see why. Dutch roads with allowed speeds over 70 km/h are closed to bicycles. On the other hand, there is always a cycle path nearby which usually provides a shorter route and less hassle, plus - best of all - it is not accessible to cars. The advantage of a separated road network far outweighs the psychological discomfort of feeling "banned": both categories are banned from each other's networks. I wouldn't live long if I went for a walk on a rail track, hopping from one sleeper to another; why would I, as a cyclist, want to mingle with cars for no other reason than that I feel to be entitled to using the same road? There are easier ways to stay alive. Here we have a British example of what happens when you are legally required to use certain facilities, except this time it is pedestrians who lose what is in these examples a very hypothetical right to the road, due to the volume of traffic in these locations. What happens is that the scheme is abandoned after a year because better facilities are a more sensible idea than better enforcement. It ought to be pointed out that in many countries, people have legal rights on paper that do not exist in reality as the infrastructure does not exist to support it and/or the judiciary are unwilling to prosecute those that infringe on those rights. Cycling on certain "rights of way" in the UK could be considered to be one of these hypothetical rights. The infrastructure is not suitable for the general public to use, and a judge will probably let off a driver who kills you with a suspended sentence. If you think riding on the streets are safe, why the heck that you only see young and middle-aged men riding. On cycle paths, you see anyone from 8 to 80 and not wearing a helmet. Let me ask you this, why are you wearing a helmet if you think the riding on street is safe? Dutchman checking in here, nearly falling from my chair laughing at Ian Brett Cooper's comments. His comment that cycle paths are "slow, too narrow, the surface is often of poorer quality" is not an accurate description of reality, but it does have a lot of comedic value. I'm quite amazed at some foreigner's insistence on "the right to ride on the road". I don't get why you would want to put yourself in the path of fast and heavy vehicles. Do they also insist on their right to walk on the road? Part of the problem reflected in this debate is that the United States has not and...now that we are increasingly poor and bankrupt (trillion dollar wars will do that to one) will not invest in significant bicycling infrastructure. It's an afterthought, a trivial part of the infrastructure. And...efforts to build more are hysterically derided by an increasingly aging and delusional population convinced that bicycling is a communist plot. Hence, "we" need to "demand" our rights to the roadways, because there will certainly be no bicycle infrastructure as an alternative. And, a population as obese and ignorant as Americans see cyclists as the enemy, because we slow them down during their 30 mile commutes and daily trips to the suburban big box stores. While I agree 110% with David and am envious of what Holland has done, I also understand the defensiveness of Ian. It's amusing to read these arguments going back and forth. Cycling is just a mode of transport in the Netherlands, although in most cases a very pleasant one and less stressful compared to driving. As a Dutch cyclist you just want to get from A to B and a cycle path ensure a safe way to do that. The large number of cycle paths ensures that you can always find a series of paths that leads you to your destination. The vast majority of cycle paths are within the towns. Yes they are slow for a (race) cyclist who wants to go 15+ mph, but why the hurry? The majority of cycle journeys are within 5 miles (7,5 km). Trying to go quick makes no sense at those distances. If you are long distance cyclist be prepared to cycle around the city centres or towns. Although an old post, I felt the obligation to comment on Ians point. As a Dutch cyclist for both transportation and recreation (fast cycling) I do feel that these types of cycling sometimes hinder each other. Fast cyclists therefore sometimes end up on the road with cars, even though they're not allowed to. But this is only a problem in a very few places, where separate cycling lanes are too narrow and car traffic is too high. Often this happens in cities/villages where there's not enough space to allow for proper separation. The funny thing of course is that it's often very easy to evade those points. As a fast cyclist I prefer to take the non-through roads to get out of the city. These roads have only slow driving cars, normal cyclists and enough space to manoeuvre around them (I can use the whole width of the road, as these don't have separated bike lanes). As soon as I get out of the city on separated lanes, they're wide enough for both the normal and fast cyclist. Often I end up on roads which are only used for recreation (both fast and slow) and an agricultural vehicle here and there. These as well have enough room for everyone, from the slow grandma with grandkid to the high speed professional cyclist.